Home / Germany / #Germany: Cops Banned Demos in Solidarity with #Afrin in #Cologne and #Duisburg. Come to #Wuppertal! Germany: Cops Banned Demos in Solidarity with #Afrin in Cologne and Duisburg. Come to Wuppertal! After the ban was announced people started to mobilze to Duisburg. But that demo was banned as well. The cops confiscated flags and kettled many people to check their id’s. At least 2 people were detained (Image above). The German state is stepping up it’s repression against people who want to protest in solidarity with Afrin. Many of the weapons that are used by the Turkish army to kill people in Afrin were made in Germany, it is very clear what the position of the German state in this conflict is. Last month the German federal government said it was “concerned” about the Turkish invasion of Afrin but also said that “Turkey has legitimate security reasons” for their action. In other words the German state has turned it’s back to the Kurdish militias that fought effectively against ISIS (Daesh). That’s not suprising, the German state always was a close ally with the Turkish state. Many leftwing Kurdish and Turkish activists are imprisoned in Germany and the German government fears that Erdogan might terminate the EU Turkey deal when they critisize Erdogan’s killing of kurds in the south-east of Turkey and his military aggression in Afrin. It seems that protests in solidarity with Afrin are not allowed anymore and if people want to continue they will have to find an answer to the repression they are facing right now. The fact that the cops have stopped, dissolved and/or banned demonstrations in the past weeks must be reason enough to push the campaign in solidarity with Afrin and Rojava to another level. 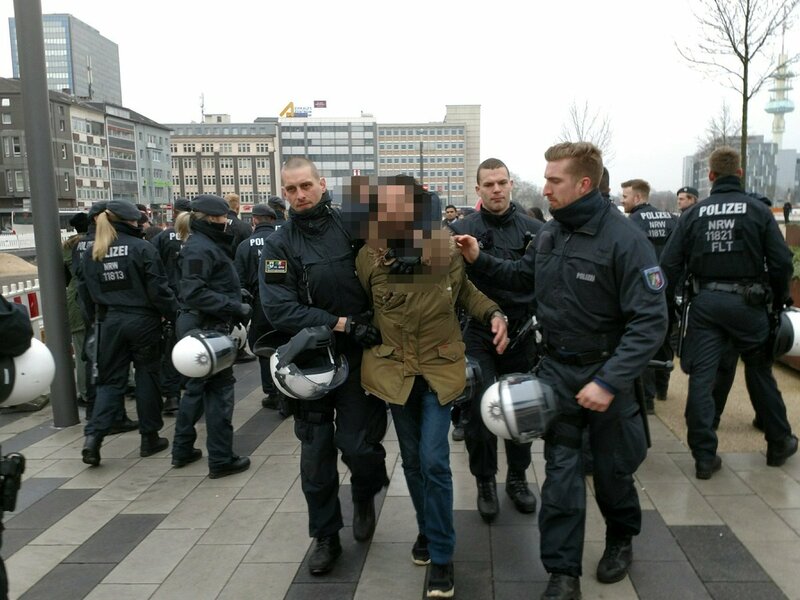 In a press release police authorities in Duisburg said they dissolved todays demonstration in Duisburg after riot cops from Wuppertal reinforced the cops that were already there. That wasn’t the first time that cops from Wuppertal played a prominent role in repressing protests in solidarity with Afrin. In Cologne the riot cops from Wuppertal were the ones that started the skirmishes on Ebertplatz in Cologne on January 27 after one of them had hit an old man. On Tuesday February 13 there will be a demonstration in solidarity with Afrin in Wuppertal. People will meet at 06:00pm (18:00) in front of the City Arkaden on the Alte Freiheit in Wuppertal. Come to Wuppertal to show solidarity with the people in Afrin and for the right to take the streets. #Germany: Demo in Solidarity With #Afrin Marched in #Wuppertal. All Afrin Demos from NAV-DEM Banned – Enough is Enough! Cops attacked autonomous #MayDay demo in #Wuppertal, Germany – Enough is Enough!